If You Want to be Understood ... Listen. Two Moroccan boys set out to look after their family's herd of goats, but when one of them tests his stolen rifle, the bullet finds an unintended target. In an instant, the lives of four separate groups of strangers on three different continents collide. Caught up in an accident that escalates beyond anyone's control are a vacationing American couple (Brad Pitt, Cate Blanchett), a rebellious deaf Japanese teenager and her father, and a Mexican nanny who, without permission, takes two American children across the border. $389.351 thousand on 7 screens. With a title like Babel, you expect a movie that takes unusual paths, and that’s exactly what you get with this challenging 2006 film. A Moroccan family acquires a rifle to kill jackals that threaten their sheep. Left with two young sons Ahmed (Said Tarchani) and Yussef (Boubker Ait El Caid) to guard the animals, they debate whether it can shoot as far as promised. They decide to fire at a moving tour bus and they succeed. From there we go to San Diego to meet a Mexican housekeeper named Amelia (Adriana Barraza). She cares for Mike (Nathan Gamble) and Debbie (Elle Fanning), the kids of an American couple. Amelia’s son is getting married and she gets stuck looking after Mike and Debbie the day of the ceremony. They go off to the event with Amelia’s nephew Santiago (Gael Garcia Bernal). As for the kids’ parents, Richard (Brad Pitt) and Susan Jones (Cate Blanchett) are in Morocco as a getaway to try to help relieve some marital stress. This doesn’t work, and it gets worse when that bullet I mentioned earlier strikes their tour bus… and hits Susan in the neck. Abruptly the movie leaves that scene to take us to Japan and introduce us to Chieko (Rinko Kakuchi), a deaf teen girl who lives with her widowed dad Yasujiro Wataya (Koji Yakusho). Her mother died under suspicious circumstances and she remains somewhat distant from her father. Her burgeoning sexuality also causes her to act out in unusual ways. Babel traces and ultimately connects all of these different stories. The movie veers from one to another constantly as it slowly manages to intertwine them. All of this leads us to see the ways the tales are related and how they end. In structure, I find a lot about Babel that reminds me of 2000’s Traffic and 2005’s Crash. All three flicks feature interwoven narratives, large ensemble casts, and topical subject matter. In execution, I’m happy to report that Babel is much more like the engrossing Traffic than the superficial Crash. The film integrates its different stories surprisingly well. It melds them smoothly and doesn’t become frustrating despite the apparent lack of connection. Indeed, the story that seems to most tangential – Chieko’s – often becomes the most intriguing partially due to its vague attachment to the other three tales. We can easily connect those threads, but it takes awhile before we figure out what we’re doing in Japan. That factor allows those scenes to keep us even more involved since we work harder to establish a link. In a related vein, I very much like the fact Babel doesn’t spell everything out for us. For instance, we don’t get beaten over the head about the conflict between Richard and Susan. If we pay attention, we figure out that it relates to the demise of their infant son, but the film leaves this in the background. That’s an effective technique, as it allows the story to evolve naturally without scenes of obvious exposition. Babel definitely shouldn’t be viewed as a star vehicle for Pitt and/or Blanchett. It includes no leading roles, as everyone’s a supporting actor ala Traffic. The PR people obviously billed Pitt and Blanchett highest for marketing value, but they aren’t the main focus of the film, so don’t expect them to dominate the flick. Actually, thematic material would be the star of Babel. Obviously it pushes a subtext of culture clash. That relates to the title and accentuates the ways that we find it tough to get along. The movie doesn’t overstate this and give us the mind-numbingly obvious treatment of Crash. Yeah, the interconnections stretch credulity, but they meld together reasonably well and don’t cause too much eye rolling. Political messages also materialize in Babel. If we look, we can find messages in there connected to US policies about terrorism, border control and firearms, but the movie remains acceptably low-key about these. They’re there, but they’re not shoved down our throats. 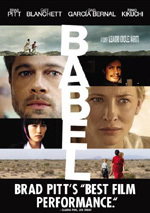 Because of the movie’s deftly interlocking stories and its understated approach, Babel succeeds. It takes a challenging narrative and weaves the elements together in a satisfying manner. This ends up as a memorable experience. 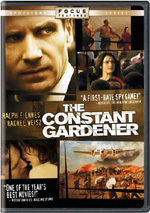 Babel appears in an aspect ratio of approximately 1.85:1 on this single-sided, double-layered DVD; the image has been enhanced for 16X9 televisions. No problems marred this consistently positive transfer. Sharpness looked good. At no times did any issues with softness materialize. The movie was crisp and concise from start to finish. I noticed no jagged edges or shimmering, and edge enhancement seemed absent. Some light stylized grain appeared, but otherwise the movie lacked any source concerns. As one might expect from this sort of film, the palette varied and went with stylized tones much of the time. Actually, the colors were reasonably natural through a lot of the flick; they didn’t go with the ultra-stylization of Traffic. Within the parameters of the different settings, the hues seemed full and well rendered. Blacks appeared deep and full, while shadows showed good clarity and delineation. This was a satisfying visual presentation. Although the Dolby Digital 5.1 soundtrack of Babel suffered from no flaws, it came across as surprisingly subdued. With all the various settings and different kinds of action, I thought we’d get a more involving presentation. Instead, the material stayed heavily focused on the front speakers and didn’t broaden tremendously well. Music showed nice stereo imaging, and effects spread to the sides with reasonable efficiency. They just never really stood out as too memorable. The same went for the surrounds. The back speakers reinforced music and effects but didn’t add a lot to the proceedings. The Japanese scenes were the most active, as streets and clubs brought out greater vivacity. However, these didn’t kick into high gear at any time, and the track remained moderately restrained in a way that became slightly disappointing. At least the audio quality was fine. Speech sounded crisp and natural, with no edginess or other issues. Music was full and dynamic, as the score and songs showed nice definition. Effects also came across as clear and accurate, with good low-end when appropriate. The restricted soundfield of the mix left it with a “B-“. Babel comes almost totally devoid of extras. In addition to the flick’s trailer, we get Previews for Black Snake Moan, Perfume: The Story of a Murderer, Flags Of Our Fathers, Things We Lost In the Fire. It seems odd that a high-profile flick like this includes so little. The absence of extras comes as more of a disappointment than usual given the fertile territory plowed by Babel. The movie follows such an interesting path that it seems open for the sort of examination that comes with DVD supplements. This is a rich, engrossing film that keeps us alert and occupied. The DVD offers excellent picture along with decent audio and virtually no extras. Babel definitely deserves a look.